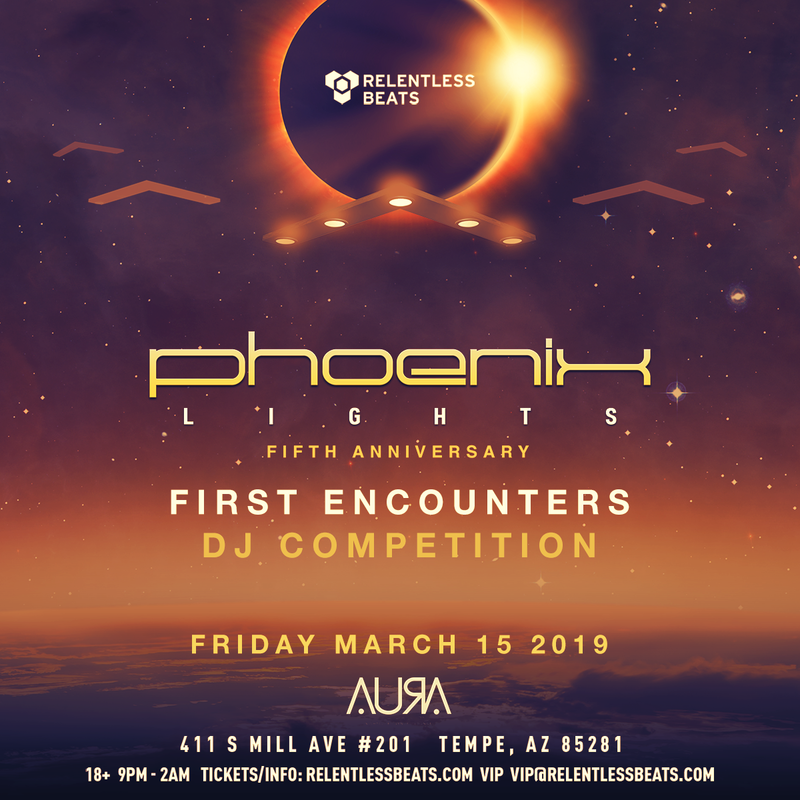 Phoenix Lights presents the 3rd annual First Encounters DJ Competition. Compete to win an opening slot at Phoenix Lights Festival 201 featuring A$AP Ferg, Excision, Griz, Kaskade and many many more! 1. Must not have played any 2017 or 2018 Relentless Beats show as support to a headliner, hence the title “First Encounters”. 2. Please record a demo set and upload to your SoundCloud or MixCloud account. The set needs to be at least 30 minutes long and feature your style of music. In other words, don’t submit a trance set and play dubstep during your performance. 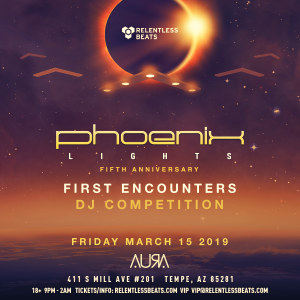 The mix does not need to be exclusive for the competition, but the fresher the better ☺ Name this set “PHXL First Encounters AZ 2019” so we can find it easily. 4. All submissions must be in by 11:59PM on February 17, 2019. 10 applicants will be selected by the Relentless Beats team to compete along with 2 Wild Cards to fill any no-shows. 6. All DJs will need to arrive at AURA at 8:30PM to check in and encouraged to support the other DJs throughout the competition. 7. Winner of opening Phoenix Lights time slot will be announced at the end of the show. You can perform on any equipment or software you want provided that it will work with the AURA DJ Booth limitations. The DJ Booth will have 2 PIONEER CDJ 2000 Nexus 2 and a DJM 900 NXS2 mixer ready to go. NO pulling equipment. There are two open lines on the mixer and approximately 16in of space for additional equipment on either side of the CDJs. You may use the CDJs or one open area of the booth& one open channel on the mixer. You cannot use both the open channels or both open areas. An RCA will be provided and hooked to the mixer. Your set time will be timed to the minute so make sure you prepare for a solid 20 minute set. We will cut you off if you run over. Don’t worry we will be there to give you notice on time. You must be an adult (18+) to compete. All forms of electronic music are accepted. You will be provide an unlimited $5 guestlist and you must have at least 10 people actually show up to support your performance. This is the minimal requirement to qualify for the prizes. Our guestlist system will keep track of the guests that show up. DJs, big and small, put a lot of effort into promoting themselves. If you take the PHXL stage, we want someone who pushes himself or herself as an artist. We have a theory; if you don’t have people who believe in and support your music, we probably won’t either. Interactive Judging: Track Selection, DJ Booth Presence, Crowd Interaction/Response.